Mildred Seaver of Needham, Massachusetts was one of the matriarchs of early hostadom. This hybrid of an unnamed seedling × H. 'Frances Williams' was registered by Dr. Kevin Vaughn of Massachusetts in 1981 and named in her honor. 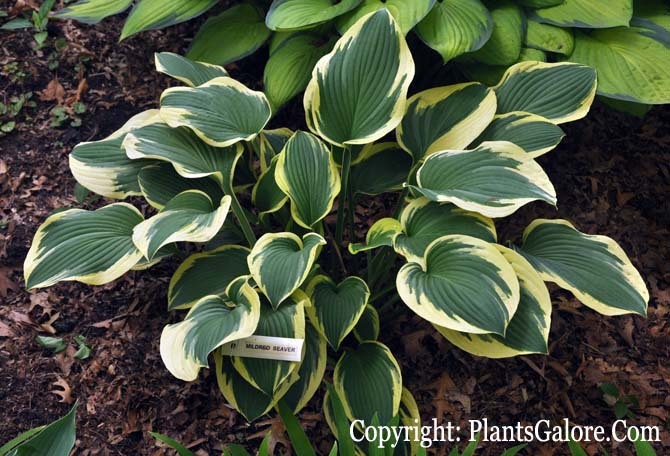 It is a large size (22 inches high) green hosta with creamy white margins that provide a good contrast. The leaves are slightly wavy and slightly corrugated with good substance. The plant bears pale lavender flowers in July. According to The Hostapedia by Mark Zilis (2009), this cultivar is a sibling to 'Breeder's Choice', 'William Lachman' and 'Christmas Tree'.